I doubt this version runs on XP. Windows 7 has no problem, but XP throws "This application failed to start etc.". @ smaragdus: Thanks I really hate to have to sign in or open an account just to download a freeware app. I find this to be a very good and useful program which does everything I want it to do... what a concept :) thanks for the hard work the maker of this software endured, it is greatly appreciated. Awesome product! Absolutely. Tried so many of its kind but once I came to know of ToDoList and started using it, that was it. Easy, versatile and a plethora of features. Loved it. Loving it. Will always love it. Hats off to its author, ever. ToDoList 6.9.3 has been released. ToDoList 6.9 has been released. Current version is 6.7.7.0 (2013-08-17). Website download link has a more current version of ToDoList than v6.5.8. Been trying to test ToDoList and TaskCoach side by side. Both have some nice features that the other one doesn't but ToDoList nudges TaskCoach out based on overall feature set. However, a couple of wishlist items for ToDoList. 1. Allow the user to move the columns and widen the columns. 2. Allow for drag and drop of more than one file to be added to a task/project. 3. Add templates for tasks and sub-tasks. Wonderful app; it beat out both TaskCoach and DevProject Manager to earn the only Project Manager spot on my computer. I'd recommend it to anyone. Version 5.4 automatically assumes settings saved to .ini file. Nice interface. Needs work. Tree view does not allow for manually setting the view length of any field. Time on project feature seems real time only. Does not seem to allow for manual entry of time on a project item. While this software has potential, a better choice for immediate use would be TaskCoachPortable from portable apps. The best to-do list manager! The bugs I mentioned at that time have been worked out. I wanted to edit out the, no longer pertinent, complaint from my previous post but I don't see a way to do that here. So, my current disclaimer is, ignore my first post. Nice tool. 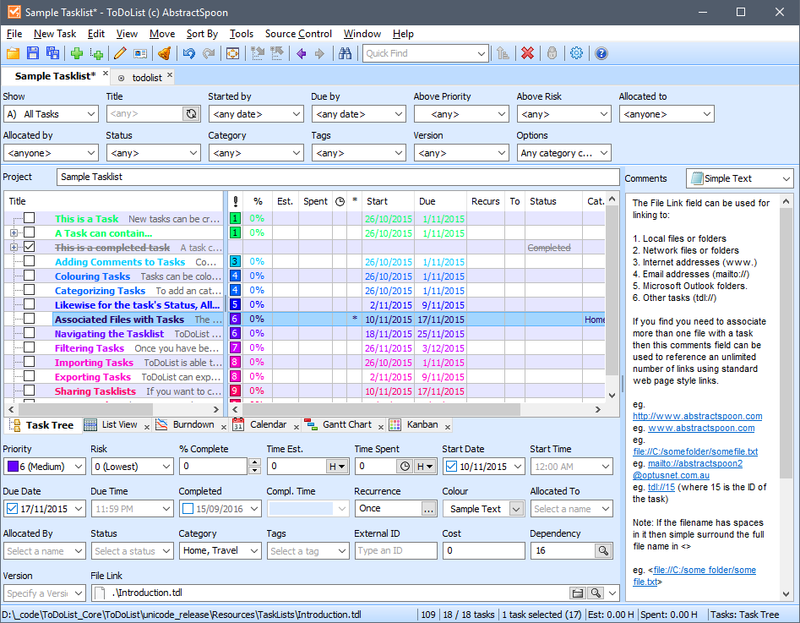 Transforming the active tasklist is very usefull for presentation in several formats. Good use of stylesheet. CSV-format suitable for import in MS Projects as initial setup or exchanging tasklists. Use BugMeNot to download the file. I love this app. The development is quick, releases are regular, which means the author is on his toes. Its a big plus when considering a software. As for downloading, dont use a download manager. Dead links at the download page after having "signed up". It's a pain. This version is very buggy. Some of the default keyboard shortcuts do not work; (ctrl-shift-space) for example. Download the previous version or wait until the next one. Aside from this version being a problem. This is one of the best and most used programs on my computer. If you like to organize your thoughts and projects, use this. I have been looking for some encarnation of ToDoList for years and found it about 6 months ago. Hallelujah! Oh, and if any developers see this. I have only one feature request. It would be so useful if we could drag a Task item onto the Tab of a different Tasklist and have it appear in the destination Tasklist. It would streamline the organization of related Tasklists. Currently it seems only importing a whole Tasklist into another is possible. Use ToDoList for abiut 6 months. Very convinient program. I use it in GTD-way (Getting Things Done). Great piece of software. I use it every day since about 2 months and I cannot live without it. Good product, but the ini-file contains direct reference to last used disk. Nice tool, i've started using it today and it's great and simple. GTH Lotus Notes! I only hope this one worked on Linux natively but i'm almost sure Wine will do good.